Pedestrian-oriented streets not only are safer, improve air quality, and encourage physical activity, but also facilitate commercial and social activity. Although China has rapidly urbanized in the past few decades, many cities across the country are still not easily walkable. According to the China Council for International Cooperation on Environment (CCICED), 82 percent of Chinese residents indicated that they are not satisfied with the walkability of their city. With increasingly large cities, China’s urban population has experienced a decrease in quality of health, caused in part by heavy air pollution and sinking levels of physical activity. Given the growing concerns about public health as well as the benefits of pedestrianization, creating vibrant, walkable streets is becoming an urgent priority in Chinese cities. On the national stage, China has designed and put forward its national urbanization plan which encourages pedestrianization. On the local level, cities are exploring a variety of strategies for pedestrianizing their streets and open spaces to benefit urban development. Moving forward, it is critical that China both prioritizes its pedestrian population and monitors the results of these changes. 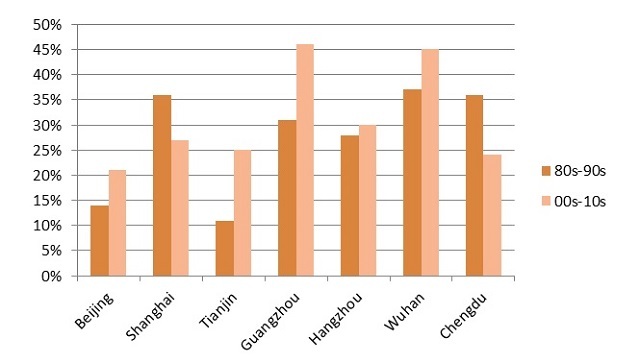 Changes in mode shares of walking in selected Chinese cities (1986-92 vs 2003-10). In most cities, the percentage of individuals walking has increased over time. Graphic by Wei Li. In China, pedestrian-only streets are the most common type of pedestrianization projects — with more than 100 cities containing at least one. Pedestrian streets bring considerable economic benefits to cities. Beijing’s Wangfujing, for example, was visited by 250,000 people per day at its peak, while Shanghai’s Nanjing Road crests at 2 million – the highest in China. Taking advantage of the foot traffic, commercial development typically lines the majority of these streets. Modern pedestrian streets usually feature shopping malls with wide streets, exemplified by Wangfujing Street and Nanjing Road. Recently, historical redevelopment in traditionally narrow alleys and old buildings has gained popularity. However, among the commercial success underlies major problems. Noise pollution, displacement of residents during transition phases, and traffic congestion often harm their effectiveness and appeal. Therefore, a more comprehensive approach is needed to create walking environments that benefit cities as a whole and avoids these problems. 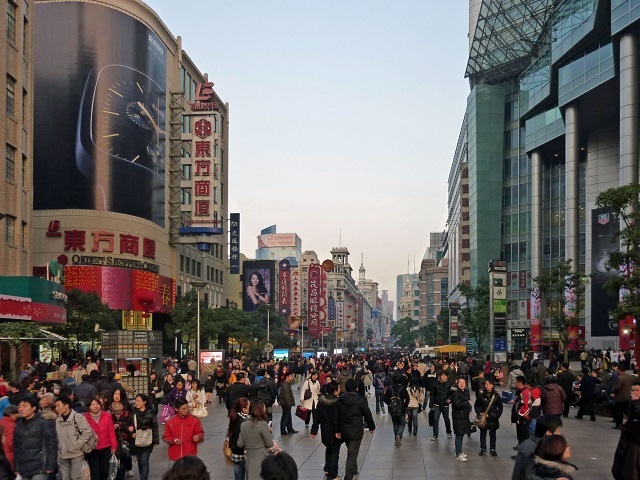 Beyond pedestrian streets, Chinese cities are also exploring larger pedestrianization zones which offer heightened walkability to connect open spaces with other modes of transport. Particularly notable among them is The Bund in Shanghai. Attracting millions of visitors to the area, The Bund is the signature waterfront area in central Shanghai. However, the old Bund was not well designed for pedestrians, sporting an 11-lane highway (partly elevated) that cuts through the area. Furthermore, the huge amount of pedestrians also strained the capacity of the sightseeing deck. 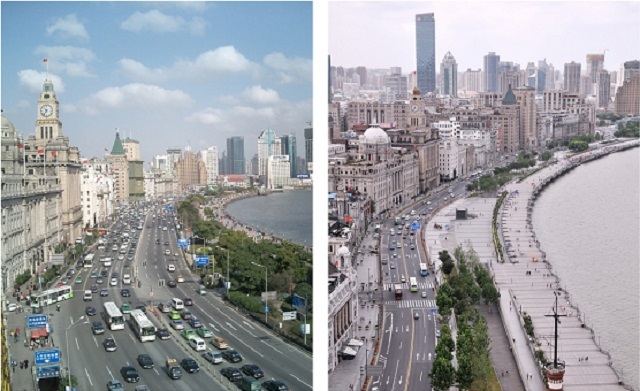 In response to these problems, Shanghai’s Government implemented a massive retrofitting project between 2008 and 2010. By removing seven lanes from the street, the project reduced 70 percent of vehicle traffic in the area. The project also tore down the elevated section of the highway and replaced it with crosswalks, increasing overall pedestrian connectivity. Lastly, the endeavor expanded the area of the sightseeing deck by 40 percent and redesigned the open spaces along the river. More recently, the city expanded the walkable area into a 7-km non-motorized transport zone along the river to boost space for walkers. With such good results, other cities are pedestrianizing similar areas as well. Although pedestrianization is gaining momentum in China, most projects are currently focusing exclusively on commercial development and tourism. As a result, the average citizen still lacks walkable public spaces. Because foot traffic generally consists of daily commuters, ignoring these individuals places walking citizens in an unsafe and undesirable walking environment. In order to address this gap, political will, viable financing, and proper technical capacity all need to be put into place. China has a long tradition of vibrant street life and is looking to revive those roots. In fact, the Chinese word for “shopping”(逛街) literally means “strolling around the streets”. Indeed, among many Chinese citizens, walking has not lost its popularity despite the widespread motorization of urban life. Although some cities have seen a decrease in walking in the past decades, many of them still have a robust walking population, and some cities are even experiencing a growth in pedestrian traffic. Vibrant streets, as depicted in this 12th-century 5-meter scroll (excerpt), were once central to Chinese cities. Streets served not only as a means transport, but also as places of congregation. 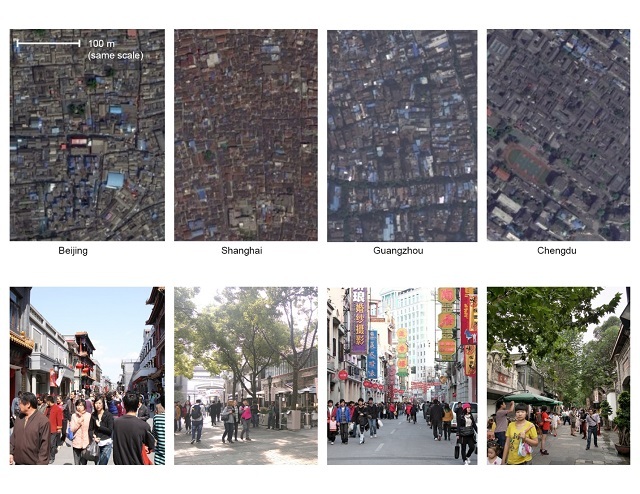 It is time for Chinese cities to design or redesign their streets for pedestrians in big ways. Simultaneously, it is also critical that cities monitor and evaluate the social and environmental impacts of pedestrianization projects so that other cities can learn from their experiences. Improving the walkability of streets and other public spaces is imperative for building on China’s walking tradition for a sustainable future.